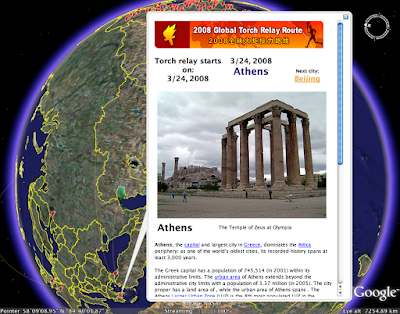 Today we launched an embeddable map and Google Earth layer that enables users around the world to follow the path of the 2008 Torch Relay as it traverses the globe. The torch will travel through cities, oceans, and even the world’s highest mountain, Mt. Qomolangma (Mt. Everest). 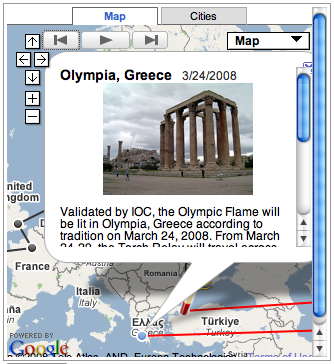 By going to http://maps.google.com/torchrelay, you can view an animated trail that starts in Olympia, Greece and follows the torch from country to country. Click on the torch icon to see route information (as it becomes available) and learn more about each city. The map will update according to the current city location, displaying a red line for each part of the path that has already been traveled. On the go? 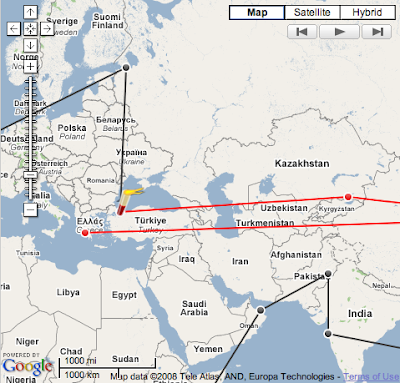 Take this map with you to any website with our embeddable API code. You can even customize it to match your page. If you'd like a more interactive exploration of the torch experience, download our Google Earth layer and watch the path unfold. Easily jump from one city to the next within the info bubble, or point your mouse over any 3D city name to jump to a specific place. 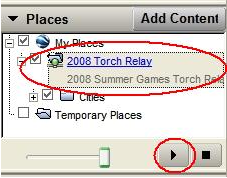 For an even better virtual experience, press the play button in the sidebar and sit back to watch the relay in action. Don't forget to save these links--we'll continue to update the map until the torch journey reaches Beijing again in August for the opening ceremony.